The cost of extra security needed during the #FeesMustFall students’ campaigns has cost millions of rands and has punched holes into the budgets of the country’s universities, a City Press investigation has found. In a desperate bid to bring back a peaceful environment needed for learning and safeguard their priceless infrastructure, universities have been forced to beef up security on their premises. The information on security costs, however, was not voluntarily given to City Press. In February, City Press was forced to use the Promotion of Access to Information Act to get 10 affected universities to reveal the amounts spent on added security on campuses. Half of the universities complied and handed over the information. The information requested included invoices and payment schedules of expenditure on private security from February 2015 to January this year. Some universities said that not all the information City Press requested could be provided because it involved third parties, which meant there were contractual restraints in place regarding disclosure. Responses were received from the University of Cape Town, Stellenbosch University, Wits University and the University of Johannesburg (UJ). With the exception of UJ, the costs are in addition to the normal monthly costs of security. 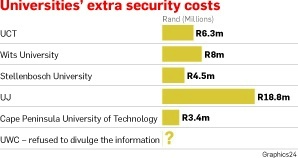 The University of Cape Town said the total extra security cost was R6 311 246.90 by the end of January. The spending was influenced by the pattern of protest activity at different times. For example, less money was spent in June 2015.
exams in November and subsequent graduation ceremonies, there was a need for an increased security presence. “The average cost per month during the period of disruption and risk of disruption was R2 million,” the university said in response to City Press’ questions. The University of Witwatersrand confirmed that it had spent an average of R2 million a month on additional security services from October 2015 to January this year – a total of R8 million. “This is, however, not the full and final amount as the university is still negotiating discounts with the security companies involved, and is in talks with insurers to cover some of the costs,” it said. Security companies had also been asked to make contributions towards student bursaries and food security programmes at the university, it said. “We would have preferred to issue final figures, but given the time and legal constraints, this has not been possible,” the university said. The amount of security personnel varied from day to day. 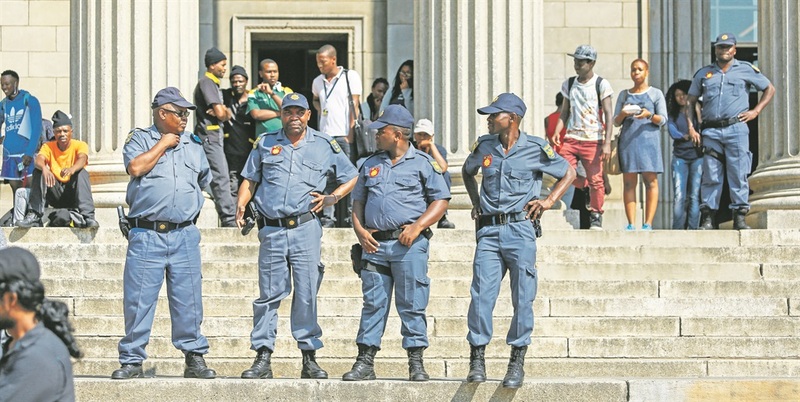 On average, Wits University deployed up to 200 security officials, depending on the risk. The level of services also varied, depending on the risk. Fidelity Security Services, Diligence Services Group and TSU Protection Services were the companies used during the months in which protests took place. The university said that it was aware of the significant cost of the additional security. However, the cost of losing a life, of potential harm to people, of malicious damage to property, and of losing the 2015 and 2016 academic years, far outweighed the amount spent. The University of Stellenbosch said it did not make use of additional private security services and/or incur additional private security costs beyond the normal operational (security) costs for the period from February 2015 to August 2015. However, additional private security costs were incurred from September 2015 to February this year because it became necessary to hire extra security personnel. These costs amounted to R4.5 million more than the normal operational security costs. UJ disclosed that before the #FeesMustFall movement’s 10-day campaign in October, it was spending on average R3.3 million a month on security. From November last year, the situation changed. This was when UJ was compelled to consider additional security measures, which led to the doubling of expenditure. The university spent R6 million from November 2015 to January this year. The total additional security cost was R18.8 million. However, the normal annual security cost – from February 2015 to January 2016 – was budgeted to be R48.8 million. The Cape Peninsula University of Technology said its normal annual security budget of R52.8 million increased by R3.4 million because of the student protests from November 2015 to January this year. The university ended up paying R56.2 million. The university refused to divulge which security companies it used, citing confidentiality agreements with its service providers.